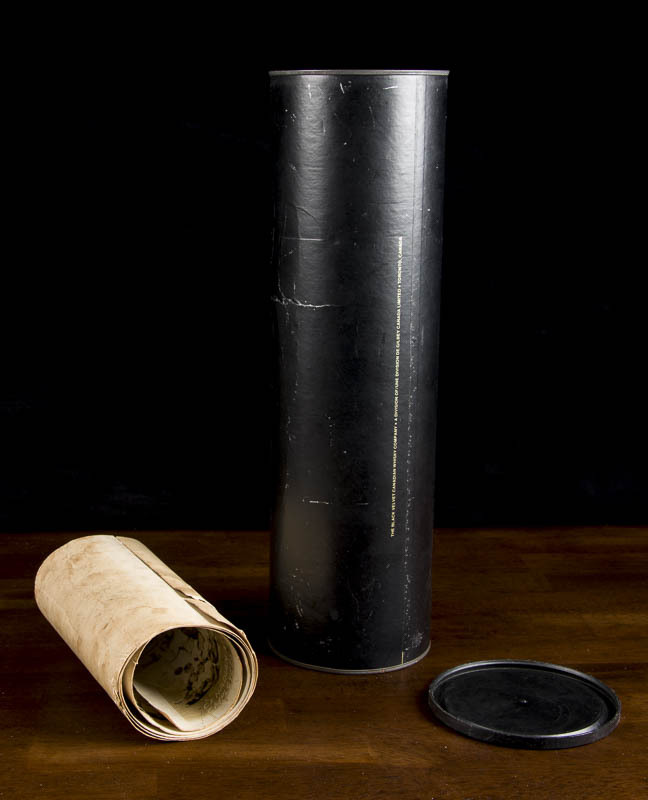 Every so often I run into a document or photograph which has been rolled up, possibly bound by elastics, and protected by a cylinder. I imagine you do too. A few years back, I asked an archivist at the Simcoe County Archives how to deal with this, and she told me the method I’ve been using ever since. To demonstrate it, I’ve got a panoramic photograph of all of the attendees for a company picnic which has been rolled up and protected in a Canadian whiskey container at least since the 1970s (these things were great! People used them for storing everything from documents to knitting needles). It was likely rolled up most of the 79 years since it was made. The problem is that over the better part of a century, it dried out. If you attempt to unroll it you will very likely break it. We have to get water back into it, without getting it wet, because there’s no telling what will happen if that happens (it won’t be good). The fancy for for getting water back into paper is “re-hydration”. You need two plastic (or metal) buckets. 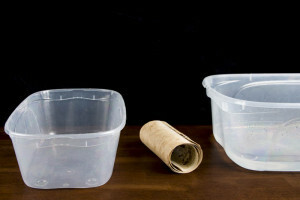 One will need to be able to fit completely inside the other, with a tight-fitting lid on the outer bucket. I use two plastic “shoe boxes” that I got from Costco once upon a time. 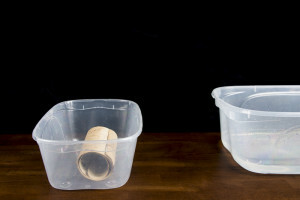 You put the document into the smaller container, and you put water in the larger container. 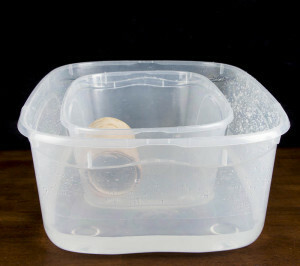 Then you put the smaller container into the larger container so it floats freely in the larger container, yet, the lid fits snugly on the larger one. 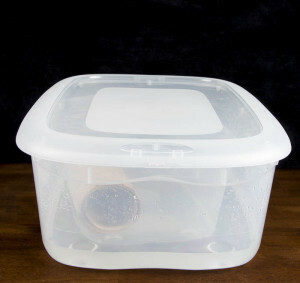 Then you put the lid on so that the smaller container can share air with the larger container (don’t have it so jammed against the lid that it stays sealed from the moisture). And you leave it for three days. You may want to smell it every day or so. You don’t want it to smell like mildew. On the third (or fourth) day when you take the roll out of the container, it should be more relaxed. It should not be wet. You should now be able to carefully flatten it out. Place clean books on it (if necessary, put tissue paper between the photograph and the books) to flatten it out for another day or two. When you take the books off, the print will still have the desire to roll back up (it’s hard to teach an old dog new tricks). 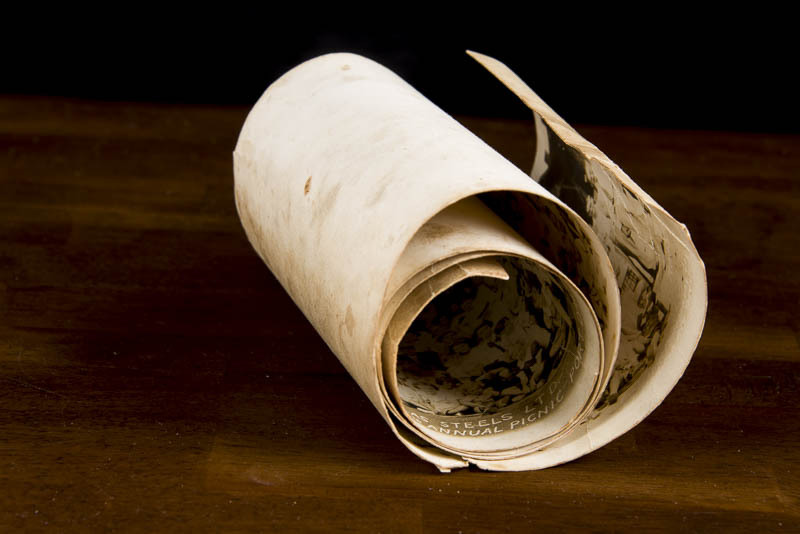 The moral of the story is, if you’ve got a hankering to roll up a document to protect it, don’t! Documents should be stored flat. I know they’re flexible, but they’re made of wood. When they dry out, they try their darnedest to imitate wood. Next week, I’ll demonstrate how to photograph a panoramic print.